Who would have thought that the simple act of sitting could be so dangerous to a person’s health? But more and more medical researchers are releasing information indicating that sitting for long periods of time can cause a variety of physical ailments. Since many Americans sit for hours a day at their jobs, this kind of information can be both enlightening and frightening. There is a lot to be said for getting up out of your chair and stretching every once in a while. When you sit for hours and hours, your blood flow slows and creates problems for several of your internal organs. Since the blood is not flowing, that means that fats can accumulate in your arteries and lead to issues such as high blood pressure and heart disease. When your muscles are idle from sitting, they tend to ignore the insulin being created by your pancreas. This causes the pancreas to keep pumping out insulin and, over time, can lead to diabetes. 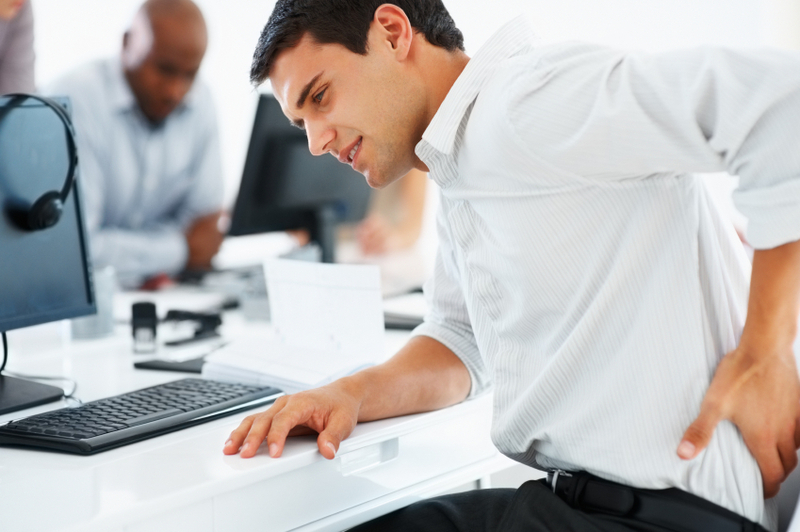 As you would expect, the muscles in your back, legs, and abdomen suffer when you sit for hours and hours. But what you probably did not know is that your hip and thigh muscles are also getting soft and that creates problems for your hip joints. Your glutes also get soft and that can put extra strain on your spine. When you don’t move your legs for hours, then the blood flow slows down and there is an accumulation of fluids in your legs that eventually finds its way to your feet and ankles. This results in swollen ankles and the always embarrassing varicose veins. You may have heard someone tell you once that sitting too long can give you herniated discs in your back, but you probably dismissed it as improbable. But there is strong medical evidence to support the notion that sitting for too long does indeed damage the delicate discs in between the vertebrae of your back. When you sit too long, you tend to slouch. When you slouch you suddenly transfer all of the pressure from your abdominal muscles to your lower back. Normally, when you stand or sit properly, your body’s weight is properly distributed throughout your abdomen, lower back, upper back, and hips. But you slouch, it all goes to your lower back. The poor position of your back along with the excess weight cause your discs to herniate over time. You can’t quit your job, so you need to find other ways of preserving your good health. One simple way is to stand at your work station for 10 minutes out of every hour. If you have the room, then do a few squats to work the hip and thigh muscles as well. Your muscles and blood flow don’t need excessive attention to stay healthy, but they do need some help. Instead of sitting at your desk for hours and then sitting in a restaurant or in the break room for lunch; go out for a walk. If there is no way to walk outside on the office grounds, then ask if there is some where you can walk in the warehouse. If all else fails, just walk around the office for 10 or 15 minutes. Ask your company for ergonomic office equipment, such as an ergonomic chair, that will help your spine and hips to stay aligned. Ergonomic accessories for your mouse and keyboard will help reduce the possibility of carpal tunnel syndrome and other painful joint conditions. Sitting has become a silent danger to workers in the United States. If you ignore the potential dangers of too much sitting when you are young, then you will regret it when you get older. To prevent the hazards that come with sitting for a long time, take the necessary steps to keep your blood flowing and your spine in line. This entry was posted on Friday, September 19th, 2014 at 12:53 pm	and is filed under Office Health. You can follow any responses to this entry through the RSS 2.0 feed. You can leave a response, or trackback from your own site.